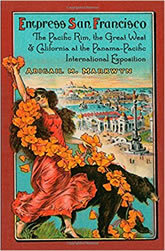 When the more than 18 million visitors poured into the Panama-Pacific International Exposition (PPIE) in San Francisco in 1915, they encountered a vision of the world born out of San Francisco’s particular local political and social climate. By seeking to please various constituent groups ranging from the government of Japan to local labor unions and neighborhood associations, fair organizers generated heated debate and conflict about who and what represented San Francisco, California, and the United States at the world’s fair. The PPIE encapsulated the social and political tensions and conflicts of pre–World War I California and presaged the emergence of San Francisco as a cosmopolitan cultural and economic center of the Pacific Rim. Empress San Francisco offers a fresh examination of this, one of the largest and most influential world’s fairs, by considering the local social and political climate of Progressive Era San Francisco. Focusing on the influence exerted by women, Asians and Asian Americans, and working-class labor unions, among others, Abigail M. Markwyn offers a unique analysis both of this world’s fair and the social construction of pre–World War I America and the West.